Eva and Otto is a true story about German opposition and resistance to Hitler as revealed through the early lives of Eva Lewinski Pfister (1910–1991) and Otto Pfister (1900–1985). It is an intimate and epic account of two Germans—Eva born Jewish, Otto born Catholic—who worked with a little-known German political group that resisted and fought against Hitler in Germany before 1933 and then in exile in Paris before the German invasion of France in May 1940. After their improbable escapes from separate internment and imprisonment in Europe, Eva obtained refuge in America in October 1940 where she worked to rescue other endangered political refugees, including Otto, with the help of Eleanor Roosevelt. As revealed in recently declassified records, Eva and Otto later engaged in different secret assignments with the US Office of Strategic Services (OSS) in support of the Allied war effort. 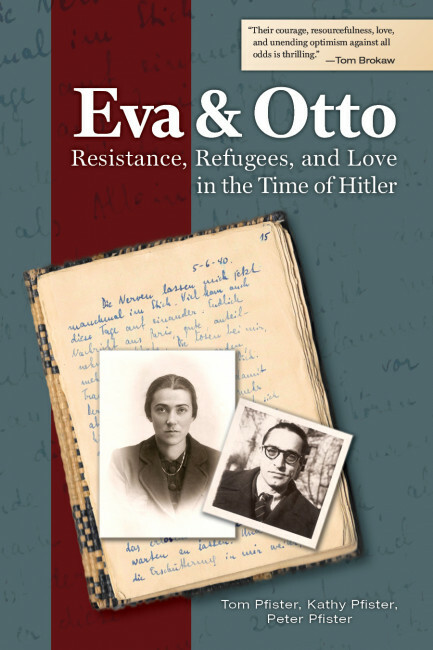 Despite their vastly different backgrounds, Eva and Otto gave each other hope and strength as they acted upon what they understood to be an ethical duty to help others threatened by fascism. The book provides a sobering insight into the personal risks and costs of a commitment to that duty. Their unusually beautiful writing—directed to each other in diaries and correspondence during two long periods of wartime separation—also reveals an unlikely and inspiring love story. Tom Pfister was a partner at the law firm of Latham & Watkins, LLP, where he practiced in its Los Angeles office for over thirty years before retiring. He currently serves on the boards of several nonprofit organizations and provides pro bono legal advice for them. Tom received his AB from Stanford University (majoring in history and German), and spent a year of study with Stanford programs in Germany. He received his JD from Harvard Law School. Kathy Pfister is a psychotherapist with a private practice in Amherst, Massachusetts. For many years, she worked as a therapist in the Counseling Service at Mount Holyoke College. During that time, she also served as a member of the adjunct faculty at the Smith College Graduate School of Social Work. Kathy received her AB from the University of California, Santa Barbara, and her master’s degree in clinical social work from the University of California, Berkeley.